AT YOUR SERVICE: Culinary champions Karina Abraham (left) and Cheyenne Hippolyte being served by the resort team at Bay Gardens Beach Resort & Spa. GROS ISLET, St. Lucia (September 7, 2018) - Caribbean nations must do more to help cultivate the gifts, talents and abilities of its young nationals. Recognizing two award-winning culinary students of St. Lucia's Soufrière Comprehensive Secondary School, Bay Gardens Resorts Executive Director Sanovnik Destang stated that both the public and private sectors ought to provide greater "financial and shepherding support" to the young people of the region. 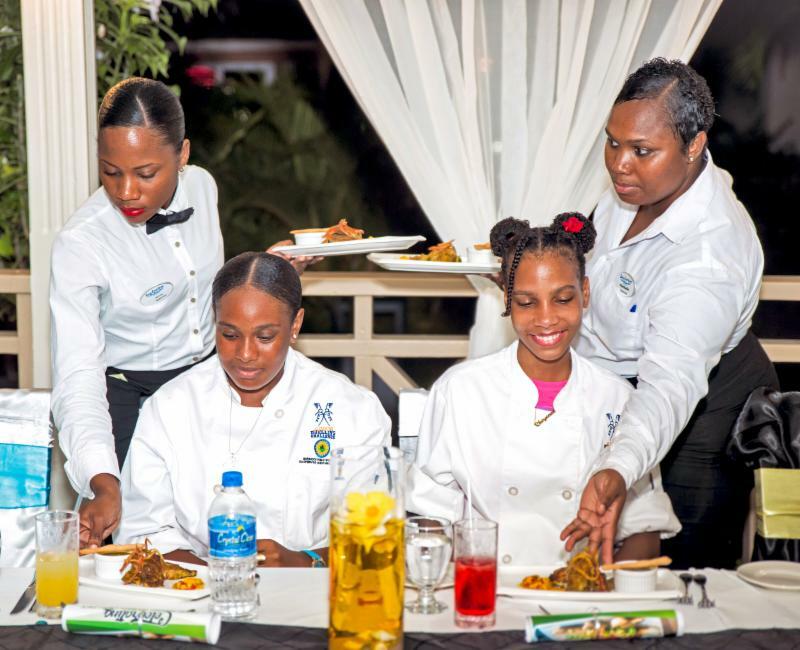 Last week Destang's resort group hosted a dining and fundraising experience to celebrate the achievements of St. Lucian students and culinary champs Karina Abraham and Cheyenne Hippolyte, who recently won the prestigious 2018 Caribbean Junior Duelling Challenge competition in Barbados. "We really do not do enough as a country to celebrate our stars, the people who bring home gold for us ... and felt compelled to go beyond simply hosting an event," Destang said, explaining that the occasion helped to showcase the culinary styles and masterpieces of the island's chefs, while raising funds to support the educational needs of Abraham and Hippolyte. With the support of industry partners - including the St. Lucia Hotel and Tourism Association's Tourism Enhancement Fund, Serenity Vacations & Tours and Orlando's Restaurant & Bar - Bay Gardens Resorts provided an assortment of prizes such as day passes, sea cruises and vacations, which were auctioned as part of the fundraiser, held at Bay Gardens Beach Resort & Spa's Hi Tide Restaurant. In addition to benefiting from the proceeds of the auction, the young chefs' culinary creations will be celebrated at Hi Tide Restaurant restaurant for the foreseeable future. "We will take their award-winning dish, put it on our menu, recognize it as their dish, track the sales from it through our accounting system, a portion of which will go towards their education," announced Destang, who is a Certified Public Accountant. Bay Gardens Resorts' management team was joined by representatives of the St. Lucia Hotel and Tourism Association; Jade Mountain and Anse Chastanet resorts; Herod Stanislas, Parliamentary Representative for Soufrière and Minister in the Ministry for Economic Development, Housing, Urban Renewal, Transport and Civil Aviation; and Leonard Montoute, Minister for Equity, Social Justice and Empowerment. The Executive Director welcomed the announcement from Minister Stanislas that the government would cover the students' Caribbean Examinations Council (CXC) fees for the next year. At the dinner, patrons enjoyed a three-course meal featuring the winning dish from the Caribbean Junior Duelling Challenge. In addition, the resort chain's award-winning Executive Sous Chef Peter Lawrence, whose accomplishments were also heralded during the evening, presented a starter - the winning dish from the 2014 Taste of the Caribbean Culinary Competition embellished with his culinary flair and experience. Under the direction of Bay Gardens Beach Resort & Spa's Executive Chef Nicodemus Joseph, a former St. Lucia Culinary Team Captain, the chefs also prepared a dessert from scratch, utilizing locally sourced "mystery basket" ingredients, including Piton beer, guava wine, local "mammee apple" apricots, local bacon and edible begonia flowers (known locally as "bread and cheese"). Bay Gardens Resorts is a group of locally owned and operated award-winning hotels all located within, or near, Rodney Bay Village, St. Lucia's entertainment capital. 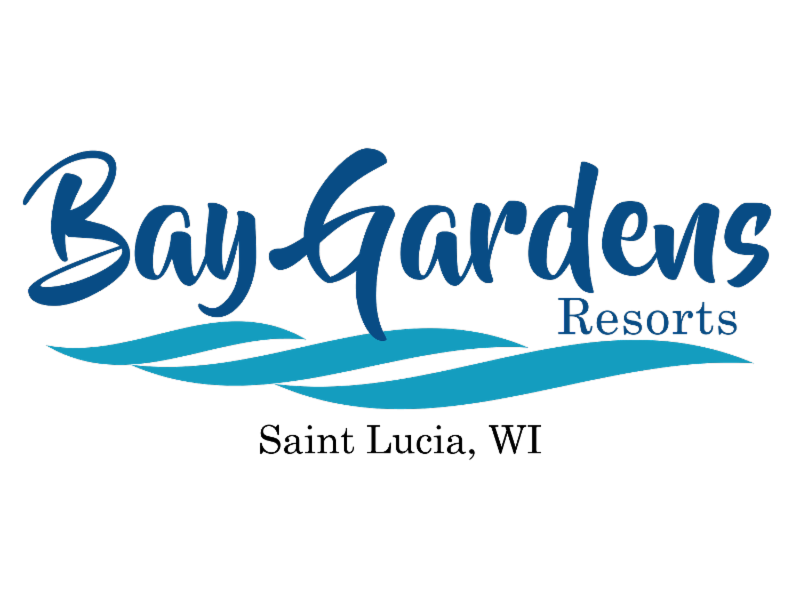 All four of Bay Gardens Resorts' properties - Bay Gardens Inn, Bay Gardens Hotel, Bay Gardens Beach Resort & Spa and Bay Gardens Marina Haven - are close to more than 40 restaurants, entertainment venues, duty-free shopping malls, Treasure Bay Casino and Rodney Bay Marina. All properties offer comfortable accommodations, traditional Caribbean cuisine, and warm Caribbean service and hospitality. Bay Gardens' Splash Island Water Park, the first open water sports park in the nation, is a popular attraction off St. Lucia's Reduit Beach.